SAN FRANCISCO (KGO) -- Well-known muralist, Douglas Miles continues to leave his mark on San Francisco with artistic interpretations of the diversity that live in the Mission District. ABC7 News was at Shotwell and 16th streets Friday as Miles completed a huge mural on the side of a building nearby. 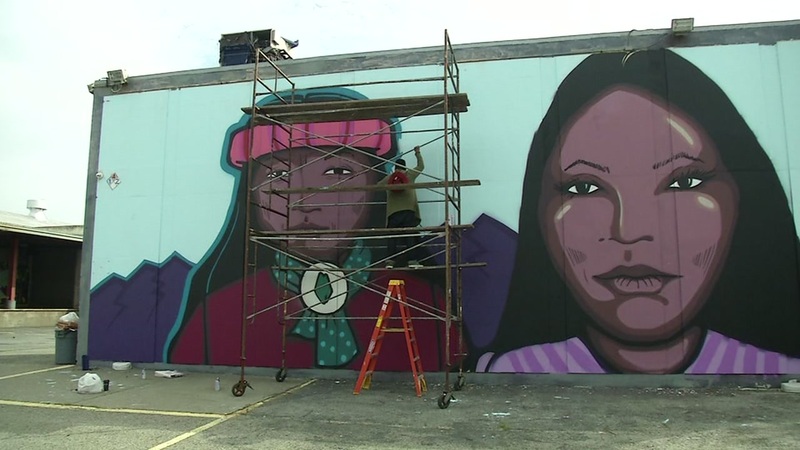 Miles says he is using spray paint to depict the faces of two Native Americans. He wants indigenous people to see the mural and feel proud of their heritage and to stand up for their rights. "I want them to feel proud of their roots. I want people to be proud of where they from. Wherever you are from, I want them to see the mural and feel that pride of place," said Miles. Miles is from the San Carlos Apache Nation. He was the artist in residence last month at The de Young Museum in San Francisco. He will paint another mural on 6th and Market streets before he returns home to Arizona.